This month Tokyo Wonder Site’s space in Shibuya gives you three artists for the price of one, or more accurately two shows for the price of none. German photographer Matthias Schaller and Stephen Dean – two talented artists were invited respectively by Germano Celant, curator of the Solomon R. Guggenheim Museum, and artist Vik Muniz to participate in the TWS Aoyama Creator in Residence programme this spring. In a separate exhibition, TEAM (Tokyo Wondersite: Emerging artists on Mezzanine) showcases Toshihiro Yashiro’s latest work in his show “Time Traveler”. Shallers’ contemporary images of the offices of the Cardinals of the Roman Curia (2004 – 2007) focus on the very absence of the individual to create a modern renaissance “portrait”. His images appear anthropological as we glimpse not only individual offices but also the halls of power plugs and all. The images repeat certain comfortingly familiar elements, such as desks, chairs and computers, but these are no typical office settings. For all the clinical neutrality in these images, there is also a hint of the theatrical. The furniture has been rearranged, objects removed and paintings placed with intent, transforming the setting into something of an unreal stage. Schaller manages to show us the theatrical in what is already there: baroque-looking ceilings co-exist with images of an office desk in-tray and adjustable wheelie chair. His is both the role of director and props manager, giving us a unique glimpse into the person or “persona” of the individual cardinals and the halls of power that house them. The work highlights photography’s supposed neutrality and distance whilst skillfully mediating our peek into a word where the borderline between theatre and the everyday is often ambiguous. Comfortably nestled in the corner of the second room is the work of Stephen Dean, featuring both collage work and video material. Working in a variety of media, Dean’s work has focused on familiar objects highlighting the banal and the beauty within the everyday. He has transformed newspapers into Klee-like miniatures, topographical diagrams transformed by bright watercolors. These are complimented by videos shot in Shibuya and the Tsukiji fish market. The overexposed images of Shibuya and various Tokyo sites translate into bright moving colors and movements. People become collages of movement, morphing into new and unexpected scenes. 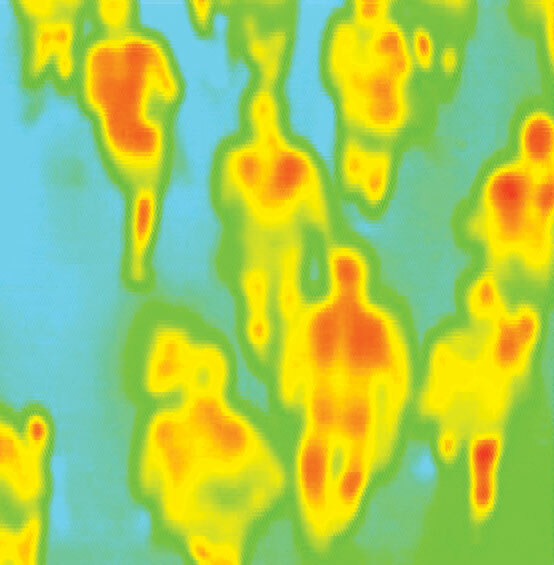 These images, which look like thermographs, contrast with the static colors of the mixed media work. Information is deconstructed and reconstructed in an aesthetically pleasing manner. He questions how we frame “everyday experiences” and provides a visually stimulating answer. Meanwhile, Toshihiro Yashiro’s new work follows thematically on from his 2007 exhibition at the prestigious Zeit Photo Salon (reviewed here by Meg Kaizu). On the mezzanine balcony, his large prints show blurry shapes in a variety of museum and outdoor settings. These are long-exposure photographs of himself or others spinning around on a single point, in colored body suits and yellow star-shaped sunglasses; the blur of movement in his works highlights photography’s potential as a medium to capture the passage of time. His earlier photographs focused on depicting Japanese community bathhouses, many of which are being closed down. His work began capturing the externals of a culture that is in the process of dying, a culture affected by migration from the countryside into the big cities, where the essence of community is redefined. In this newer work he is like a scientist exploring the essence of time through performing various experiments. His portrayal of himself as an object and his subjectivity to time and decay are clearly juxtaposed against the varying objects and settings in each of his works. In the photos downstairs (his most recent work) we are able to view more intimate black and white stills though a wooden 3-D finder. 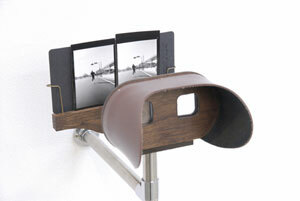 These wooden viewers simultaneously recall the kitch of the 1980s and the strictness of the Victorian approach to photography. But this vaudeville is a quiet spectacle. In these stereoscope images, a running figure is captured attempting to defy time and move beyond the frame — are we the time travelers going backwards or is his attempt to leap out of the frame an attempt to escape the little death implied in the when one’s image is captured in a photo? Yashiro’s work is both understated and playful, suggesting that his outlook is at once that of a philosopher, scientist and entertainer. All three artists work are engaging and leave you with food for thought after the bright undulating colors have faded. The art here is like a pair of 3-D glasses, a lens that makes familiar things look just a little more real.